These heavy duty steel boxes are well suited for a variety of junction and pull box and many other electrical application. These boxes have a hinged cover with slotted-head quarter-turn cam lock. Heavy duty 16 ga welded steel construction. Hinged cover with slotted-head quarter-turn cam lock. Easily removable concentric knockouts on all four sides for industry standard conduit sizes. 3” Depth box do not have knockouts on hinge side. Four wall mounting holes in back. 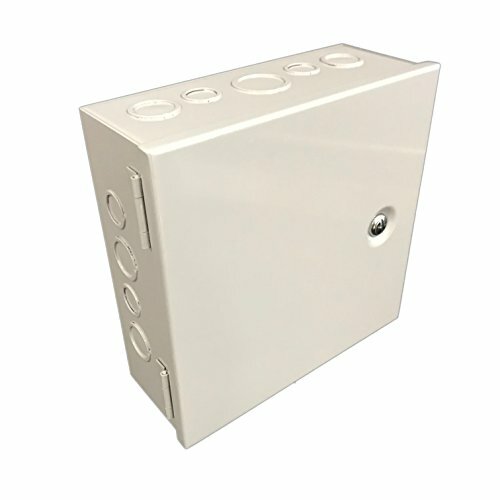 Embossed grounding hole in bottom allows easy access and flush wall mounting. Durable ANSI 65 grey powder coating. Complies with NEMA and UL type 1 rating. Ul listing pending. Ratings: NEMA 1. 40.0" Area (length by width). Hinged door, lid design. Knockouts, wall mount features.